Hwajeon is a light, fluffy rice cake that makes a great dessert or snack. With a flower on top it’s almost too beautiful to eat! Whenever I find beautiful edible flowers in the farmer’s market, I immediately feel like making hwajeon. This is what happened to me in Union Square Market here in Manhattan recently, and this video is a result! I orginally filmed a video for hwajeon in 2009, but that video is blocked in some countries because of the background music I used, so this is a remake. In Korea hwajeon are often made with edible azalea flowers which bloom wild in the mountains in springtime. People used to go out for a picnic in the early spring, bringing a heavy pan and some ingredients. They would pick the azaleas or any other edible flowers they could find, and then make and pan-fry rice cakes right there in the mountains! I can imagine how much fun that must have been, and what a great mood everyone must have been in, eating these rice cakes in the mountains, in the fresh springtime breeze after a long winter. No matter the season, these rice cakes put anyone in a good mood! Enjoy the recipe! Put sugar and water in a small sauce pot. Cook over very low heat and simmer for 5 minutes. Don’t stir it with a spoon, just make sure it gets well combined in the pot by swirling the pot every now and then. Remove from the heat and cool down. Set aside. Combine sweet rice flour and salt in a bowl. Add ¼ cup hot water and mix well with a wooden spoon until the dough has cooled enough that you can knead it by hand. Knead the dough until it’s smooth, then divide it into 5 equal-sized pieces. Roll each piece into a ball. Keep them covered with a piece of plastic wrap so they don’t dry out. Press each rice cake ball into a disc about 2½ inches (6 to 7 cm) in diameter. Heat up a non-stick pan over medium high heat. Add 2 teaspoons vegetable oil, swirling the pan to coat the surface. Once it’s heated up, turn the heat down very low. The key to beautiful hwajeon is to keep them white by pan-frying over low heat. Put the rice cakes on the pan and cook them for a few minutes. When the bottoms are slightly crispy turn them over and flatten them out with a spatula. Cook a few more minutes. 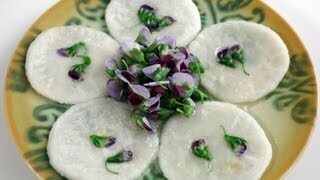 Place edible flowers on the top of each rice cake, then flip them over and press them down for 1 or 2 seconds so that the flower gets slightly cooked and sticks to the cake. Cook each one and put them on a serving plate. Drizzle the syrup on top of the rice cakes. Serve with tea as a dessert or snack. Posted on Monday, April 20th, 2009 at 6:24 pm. Last updated on October 5, 2014. Posted August 22nd, 2016 at 7:18 pm | Log in to reply. Thank you so much for this recipe! My grandmother made these slightly thicker, cooked them until golden brown and put a little honey on them. She’s not with us to teach me her recipes so I’ve been learning from your site. I want to share the delicious food with my family that she so lovingly made me and you are making it possible! Posted August 4th, 2015 at 3:24 pm | Log in to reply. I love to make these to snack on! They’re super delicious. I usually make a filling made out of honey, sesame oil and crushed peanuts and fold them over to make them like perogies or dumplings. Its super delicious! Posted September 23rd, 2013 at 2:56 am | Log in to reply. Posted March 4th, 2015 at 1:34 am | Log in to reply. Posted September 17th, 2013 at 3:18 am | Log in to reply. Posted August 29th, 2013 at 10:58 pm | Log in to reply. I can’t wait to try this! It looks great. Posted February 27th, 2012 at 9:31 am | Log in to reply. Posted February 27th, 2012 at 10:38 am | Log in to reply. oh you can prepare the dough before going to your friend’s house. The dough will be ok up to a few hours but keep it in a plastic bag so that it won’t dry out. Happy cooking! Posted February 27th, 2012 at 9:29 am | Log in to reply. What kind of syrup do you put on these? Just maple syrup? Posted February 27th, 2012 at 10:36 am | Log in to reply. Posted December 23rd, 2011 at 5:41 am | Log in to reply. I’m trying to make this recipe to offer as a dessert to my guests for Christmas. I’ve used glutinous rice flour in the past but I can’t find it anywhere in this country (they don’t have sweet rice flour either). The only thing I was able to find is normal rice flour in an organic store (we don’t have any Asian stores here). Can I use normal rice flour for this recipe? If yes, do I need to change the proportions of water? Posted February 24th, 2012 at 4:25 pm | Log in to reply. Try in a Vietnamese shop, that’s where I bought my flour (in Switzerland)….If you live close to a medium big city it should be possible to find it. Posted January 27th, 2011 at 12:20 pm | Log in to reply. i tried make it last time..but it didnt turn out good.. i dont know whats wrong..i’m followed your recipe one by one..i’m even watched your video while making it..it looked greasy and undercooked … but I just use a little oil, very little. I fried long enough. in your video it look so easy and simple. it seems you dont need a long time to fry it. i really have no idea whats wrong with it? Posted December 16th, 2010 at 2:39 am | Log in to reply. hi Maangchi is the sweet rice flour same as the sweet rice flour we use for Kimchi?? Posted December 16th, 2010 at 8:07 am | Log in to reply. yes they are the same. Sweet rice flour is also called glutinous rice flour. Posted December 1st, 2010 at 8:03 am | Log in to reply. we need to make this for a school project. This dish will be served at 1 in the afternoon. So, if we make it one or two days before, will it last? Posted December 16th, 2010 at 8:09 am | Log in to reply. Sorry about the late reply. “if we make it one or two days before, will it last?” no, you will have to make it right before serving. Posted October 4th, 2010 at 2:25 am | Log in to reply. Posted October 4th, 2010 at 10:45 am | Log in to reply. oh, no, throw it away please! eww! Sweet rice flour is called glutinous rice flour too. Check your local grocery store or any Asian grocery store. Posted August 22nd, 2010 at 7:38 pm | Log in to reply. Can I use sticky rice powder? Its so difficult to get Korean ingredients in India :-( this looks so beautiful and back home, these flowers grow in our backyard. Posted August 23rd, 2010 at 12:35 am | Log in to reply. yes, it’s sticky rice powder (glutinous rice flour). Posted May 25th, 2010 at 10:00 pm | Log in to reply. I’m a big fan of your recipes. My daughter is having world cultures day at her school, and she picked Korea because I am from there! I don’t know much about Korea, because I was adopted into an American home, so I came to you to look for a good recipe. She would make this in the morning, and then bring it to school, and so I was wondering if this would last for about 4 hours? Would it be best to put the syrup on in the morning, or wait till right before? Posted May 26th, 2010 at 9:42 am | Log in to reply. yes, 4 hours is ok. Sorry about the late reply. How did her presentation go? Drizzle syrup over the rice cake right after making it. This recipe was originally posted on April 20, 2009 at 6:24 pm by Maangchi. It was last updated on October 5, 2014. The video was watched 206,884 times on YouTube & has 3,197 likes! This video is a remade version of an earlier recipe. The original video was posted on 2009-04-20 and has 130,322 views.